When the Second World War was declared in September 1939, most of the Rolls-Royce engineering and clerical staff were moved from Derby, leaving only the main manufacturing facility at Nightingale Road. Several satellite workshops were scattered around the Derbyshire countryside to duplicate essential work, to prevent the disruption of production. Belper and District was chosen as the evacuation area to accommodate the various essential services, and several properties were requisitioned to accommodate them. During both the First and Second World Wars, Rolls-Royce ceased car production and diverted their attention to the war effort, primarily designing, developing and producing aero engines. The Chassis Division was in the charge of W.A.Robotham (Rumpty), who had been Technical Assistant to Ernest Hives, where he specialised in car development. Up to the outbreak of the Second World War it was known as the Chassis Division, as Rolls-Royce produced a framed chassis with engine, gearbox and transmission, to which a body was fitted by a variety of Coachbuilding companies, including H.J.Mulliners, James Young, Hoopers and Park Ward. The first all-steel saloon, the Silver Dawn, was designed and built at Clan Foundry, and although a chassis continued to be supplied to various coachbuilders, the name of the Division was changed to the ‘Rolls-Royce Motor Car Division’. The Aero Engine Division had commandeered all available and suitable accommodation in Belper, and it was left to Robotham to find a suitable location to keep his Chassis Division team together. His attention was directed towards Clan Foundry, at the southern end of the town, alongside the A6, opposite Park Foundry, and late in 1939 he leased the premises from the foundry owners. Information supplied by George Barrass, in his excellent book “The Iron Men of Belper” indicates that Clan Foundry became operational in 1932, producing small cast iron goods such as fireplaces, grates and manhole covers and this continued until about 1938 when the foundry ceased trading. It was a derelict, rat infested, rusty corrugated-iron group of buildings, built on a slag-heap overlooking the main railway line from Derby to Manchester, but Robotham saw that it had potential. Clan Foundry was to become an important contributor to the war effort, and became the springboard for the post war Motor Car and Diesel Engine Divisions of Rolls-Royce Ltd. The Chassis Division Design Office was located in somewhat squalid quarters at the front of the site adjacent to the A6. Life was very primitive and tough during those early stages of developing the site. A canteen was eventually set up at the north end of the site by the main road, run by Mrs Hall of Milford. The stores area, workshop, and rig testing was situated at the south end (Milford end) of the foundry, with the important experimental garage section at the north end, facing the railway line. Subsequently a machine shop was established south of the offices and at the front of the site. An antiquated boiler was eased into life to provide heating for the offices and a supply of steam for the workshops. A test bed for engine testing was built at the southwest corner if the site, using second-hand corrugated iron sheets. In 1945 a brick building was constructed in the field, about two hundred yards south of the foundry, and this housed both the Design & Detail Drawing Office and the Print Room facilities. The Detail Drawing Office moving from Campbell Street around 1946. In the early days of the war, slit trenches were dug in this field. Their true purpose was unknown, but the instruction to dig them may have been influenced by the setting up of a Local Defence Volunteers (LDV) squad - the forerunner of the Home Guard. Robotham also set up a design office/ nerve centre in a squash court which he had had built in the garden of his house in Duffield, Park Leys before the war; and this was moved to a location on the West side of the Clan Foundry site overlooking the railway. THE story of the Meteor engine and the armoured fighting vehicles that it powered is told in a fascinating book published by the Derby-based Rolls-Royce Heritage Trust. 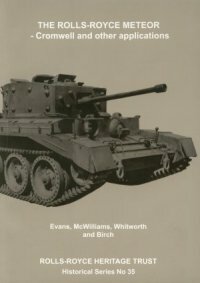 "Rolls-Royce Meteor – Cromwell and Other Applications" describes Rolls-Royce’s efforts to produce a more powerful and reliable tank engine for use during the Second World War. 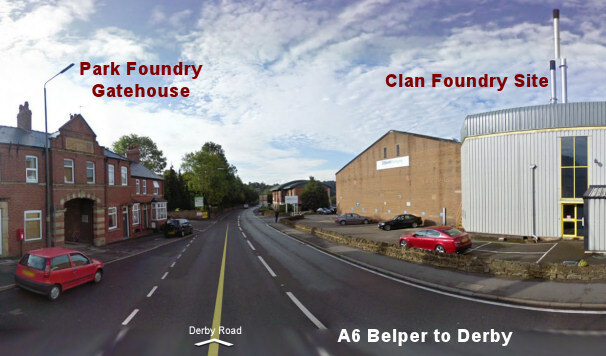 Most of the development was done at R-R’s Belper Clan Foundry. In his foreword, editor David Birch explains how Royce’s came to be involved in the application of the Meteor to the Cromwell tank. “It is quite remarkable how Rolls-Royce, in times of national crisis, has adapted itself to a role alien to its forte. In 1938, disappointed by the nation’s reliance on weaponry designed by other countries, when Britain itself had a wealth of engineering talent and capacity, the firm turned its attention to the Army’s portfolio of armoured fighting vehicles. The early days of the war exposed these vehicles as being totally inadequate for modern warfare, a fact that was noted by S W A Robotham, whose chassis division, isolated in Belper, was kicking its heels with little or nothing to do. Experience of working on motor vehicles like Rolls-Royce and Bentley cars was soon being adapted to fighting vehicles. Tanks, like aircraft, needed more power. A major battle tank also needed thick armour, a big gun and a transmission and suspension system to cope with the additional weight. To achieve this, an engine of almost double the power of those available was required. The design engineers and works staff at Belper went on to produce an engine that would remain in service for half a century.